I am on a serious Florence & The Machine kick. (I blame you, Alyssah!) It’s seriously like crack for the soul. The woman’s voice paired with the lyrics is pure genius. I am happily smitten. I tend to alternate between Rabbit Heart, Howl, Girl With One Eye, and Cosmic Love. I can listen to those four songs on repeat all day. Onto other matters. I’m toying with the idea of getting certified to teach Zumba classes. If you don’t know what Zumba is – SHAME ON YOU! It is only the most addictive, awesomely epic exercise on the planet. It allows me to shake my booty to some delicious rhythms while burning anywhere between 900-1300 calories per 60 min session. YES. You read that right. I’ve lost 26 lbs thanks to the little exercise that could. And Weight Watchers. Which by the way is the most flexible and fantastic weight loss program I’ve ever tried. I didn’t expect much when I started it, but it has changed me and how I interact with food completely. I have been trying out recipes and such from the website. Expect to see a few pictures of my failures and successes. I’m definitely getting much more adventurous with food than I used to. It’s awesome. On the writing front there are lots of interesting, and frankly terrifying, things happening. If you’ve been searching my site for Zerah, I’ve taken the pages down as the book will be temporarily unavailable. But fear not. It should be back up and ready for your consumption soon. I have big plans for my series baby. It’s been with me for a long time and I plan to see it through to completion. 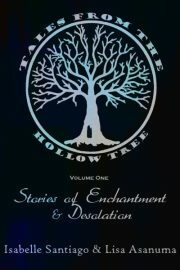 In the meantime though, I seriously encourage you to check out Hollow Tree and the plethora (love that word) of freebies Lisa Asanuma and I are dishing up weekly. My last goodie was a foray into one of my favorite subjects: time travel. It was called Edging Toward Paradox. I love that quote! So very, very true!